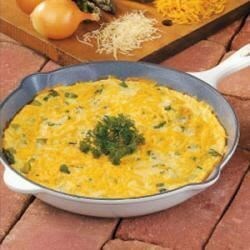 "You would never guess that egg substitute takes the place of eggs in this fun variation on a traditional frittata. Chock-full of fresh asparagus, this dish is perfect for a light springtime lunch or brunch. The recipe was sent in by James Bates of Hermiston, Oregon." In a small saucepan, bring water to a boil. Add asparagus; cover and boil for 3 minutes. Drain and immediately place asparagus in ice water; drain and pat dry. In a 10-in. ovenproof skillet, saute onion in oil until tender. Add parsley and asparagus; toss to coat. In a small bowl, combine the egg substitute, 3 tablespoons Parmesan cheese, salt and pepper. Pour over the asparagus mixture; cover and cook over medium heat for 8-10 minutes or until eggs are nearly set. Sprinkle with remaining Parmesan. Place uncovered skillet in the broiler, 6 in. from the heat, for 2 minutes or until eggs are set. Sprinkle with cheddar cheese. Cut into quarters. Serve immediately. Nutritional Analysis: One serving equals 146 calories, 5 g fat (2 g saturated fat), 8 mg cholesterol, 533 mg sodium, 9 g carbohydrate, 2 g fiber, 16 g protein. Diabetic Exchanges: 2 lean meat, 1 vegetable. I used some left over asparagus from dinner last night. I substituted 8 large eggs I had on hand since I had to feed 6. Very good results, will make again! Delicious! I was looking for an alternative to the overpriced cafeteria at work and this is it. I can now eat a healthy breakfast and save some money.